We’ve just recently crossed into the southern hemisphere. The computer is still set on home time (so, Eastern Daylight) and I’m not sure what “local” time it is. The last position report on the on-board video put us due south of Hawaii. I think we are flying quite fast enough to stay ahead of midnight but I'm not sure. My wristwatch is set to Pacific time, and it’s showing 04:00 plus or minus a minute. We’ve been snoozing, Herself a bit more steadily than I. Right now, she’s feeling awake. It’s rather dark in the plane. My computer screen is one of the brightest lights about. The on-board video system is showing something vaguely familiar, some American situation comedy. They've shown two movies, one of which was also shown on the Delta flight. Slept through most of that one before supper was served on this flight. Herself is reading over my shoulder. Well, this isn’t the nice little book she bought for our trip journal, but it is part of that journal. Maybe it’s time to break out a computer game. This aircraft doesn’t have the on-board power port for my adapter, oh well. The battery meter is showing about 75% charge remaining on the first battery. Battery Two still in reserve. I’m just thinking, despite all my commentary about Friday the 31st not existing for us this year due to crossing the International Date Line, that it actually does exist because of the travel duration time. Or maybe not. We are flying fast enough to be staying well ahead of the sun. I think we’ve crossed it; at least I glimpsed briefly a position display between movies. We’re at 11,100 meters altitude, moving at 860 kph (plus or minus), and the little plane icon edged on the verge of the International Dateline. Interesting that they show this position report periodically, helping keep us oriented to place at least. I took two ibuprofen a little bit ago; couldn’t stand sitting any longer, didn’t really need to use the head but took the opportunity anyway. Stayed up a bit, stretching out. Feels somewhat better. This is a humorous though, since I feel stiff, have a mild sinus headache, and am overall tired. After all, by the body clock (regardless of what date it is really), it’s now 10:00 A.M. and I’ve probably slept six hours... intermittently. Not much, but then again I’ve not been overly active, either. The gent sitting next to us by one empty seat is a New Zealander, living and working in Tampa and coming home for a visit. He’s given us a tip on a place to go and see, a boy’s high school. He’s also mentioned that where we land in Auckland is not exactly where we will fly out of, that we will change airports. I’m not sure exactly what this means, if it’s anything like the multiplicity of terminals at L.A. or if it’s truly a totally different airport. He also mentioned to me that tipping is not a custom in N.Z., something I'd run across in one of the travel guide books. My wristwatch is showing 20 minutes to eight, so if we’re on schedule we’ll be receiving breakfast soon. I suppose I should look forward to that. I also suppose that the “tone” of that comment reflects how I’m feeling at the end of this long flight. Still need to do some currency exchange, which will of course wait until we arrive. Regarding the airport change is why I mention this. There’s a shuttle bus between them, or we may walk. With all the luggage we’ve got, we’ll take the shuttle. Which is really Saturday, September 1, 2001 and a bit less than an hour to Auckland. That makes it a touch after 04:00 local time, I believe. I’m debating about resetting the computer’s clock and date; will probably wait until we've arrived. Were now airborne to Christchurch. Clearing Customs wasn’t difficult, even with our stating we’ve been on a farm and in contact with animals within the last 30 days. We are gracious guests, and neglected to bring any of our farm produce with us. Thus, the probability we’re bringing along Hoof & Mouth is much lower. Things started looking like the “step into the past” we’ve been informed about during the flight over the ocean. Real china and flatware on the meal trays, wine glass, nor were we asked to pay extra for the wine with dinner. Our luggage went through x-ray at Customs, no problems requesting a hand inspection of the film. Notable for a Yank, no further x-ray of luggage for the domestic connection, nor even walking through the magnetic detectors. When’s the last time I flew somewhere in the States that my carry-ons weren’t x-rayed? We did finally come across the single carry-on per person for Air New Zealand; it’s on the domestic flight. We checked Herself’s carry-on at the gate, and it should be with our other checked bags at the claim. Following a light breakfast on this flight, I’m catching up on this journal. The time is 07:40 by my watch, set to local time in Auckland. Herself is still set to Florida time, so we’re looking at near about 24 hours of travel, with 19 of that actually on aircraft and in the air. I’ve thought about that a lot on this trip. World Conference of Perioperative Nursing would be much less attended if travel to the locations were restricted to ship. At least one week to get over to Europe from the States, and that from the Eastern Seaboard. More time with train travel connections from opposite coast or anywhere inland to the ports. The time to cross the Pacific on shipboard? I am not sure, must look to CD’s messages to get a handle (though he is working for Uncle Sam so not on a cruise ship). Then, too, would be our time to cross the continent by train, or take the alternate route down the South Atlantic and around the Horn. I do believe I’ll wrap up this journal about now. It’s time to rest. We’ve been in Christchurch for four hours now. Arrived at our Bed and Breakfast via a taxi ride and the driver quite friendly and informative. Tramped about a bit to sight see while the room was cleaned up, and are now checked in. Seems I didn't specify in any of the communications with our hosts at Croydon House that our flight arrived early in the day, so we parked our bags and stepped out for a bit. We’ve also cleaned up, changed clothes, and are ready to go tramping again. We've two goals on that count, see a bit around here and try to stay awake, fighting jet lag. 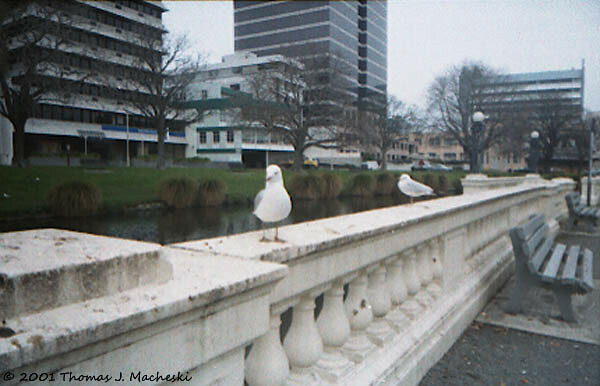 Seagulls... telling us this bridge is theirs. 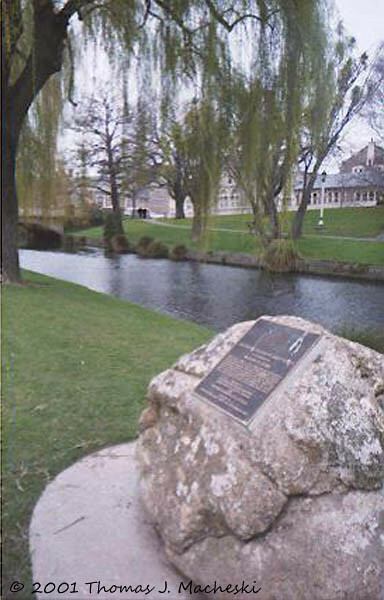 Plaque on Rock Along the River Avon, Christchurch. This entry was originally posted at http://madshutterbug.dreamwidth.org/122226.html. Please comment there using OpenID.